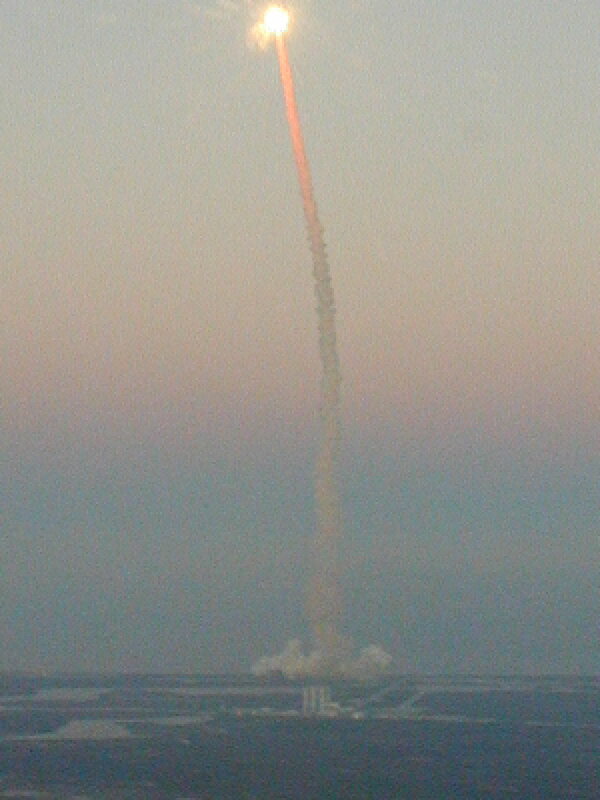 Everyone always says "if you haven't seen a shuttle launch, you really should." Well I finally did! I was in Winter Haven, Florida, attending the Lake Amphibian Flyer's Club annual fly-in and owners' meeting (as I do most years) when I heard that the 98th space shuttle mission was going to launch on February 7th, 2001. I didn't have my plane with me, but a fellow LA-4-200 owner invited me along. 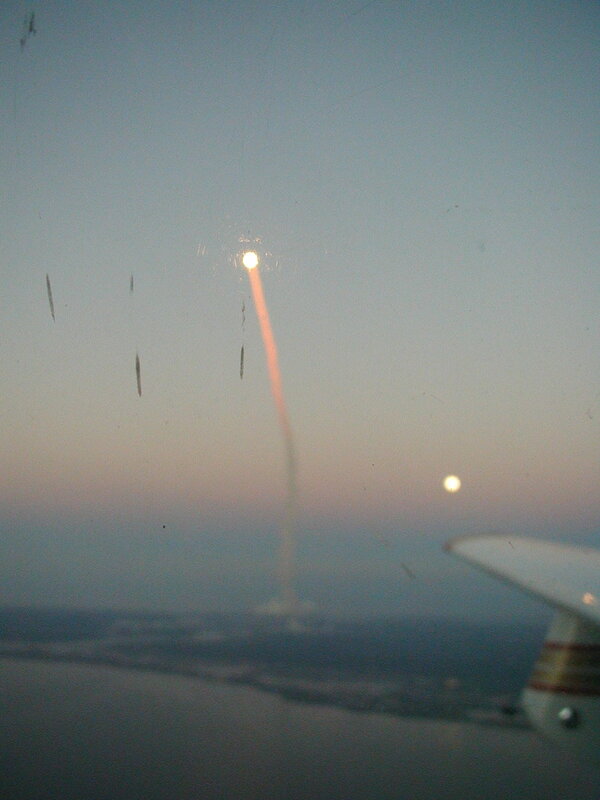 We flew up to the area just west of Kennedy Space Center, and viewed the launch from approximately 10 miles west of the launch pad. 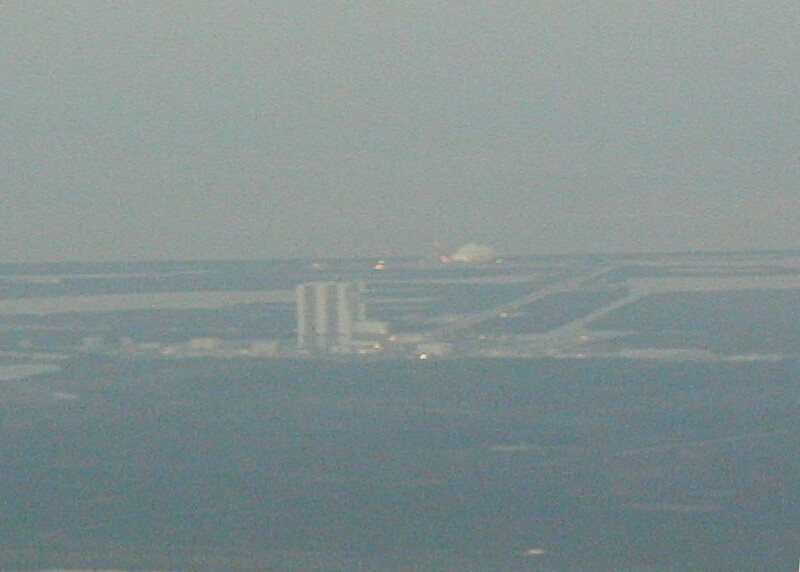 We were flying around above Space Coast Regional Airport (Titusville, FL) at an altitude of about 2700 feet. 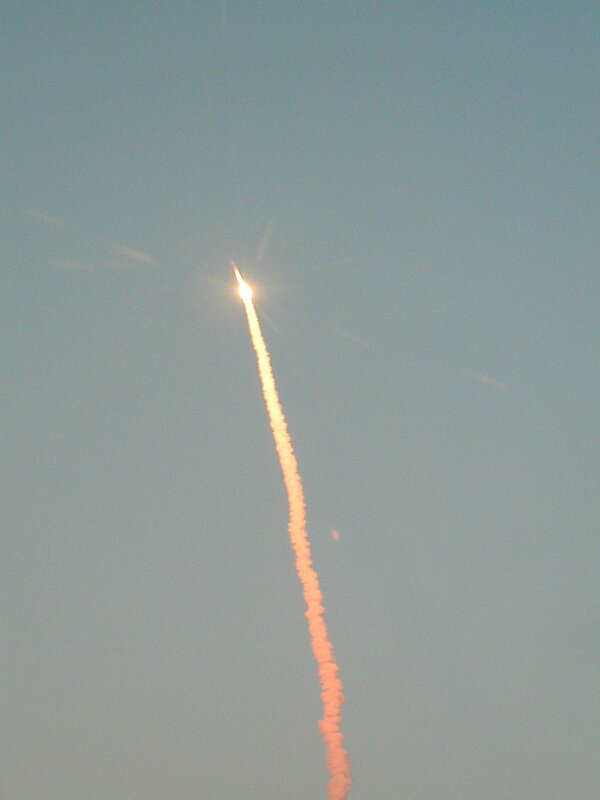 We could see the launch building, but not the shuttle itself. When the appointed time finally came (6:11 pm) the area erupted in a giant fireball, which lifted slowly into the sky, leaving a giant trail of white smoke. 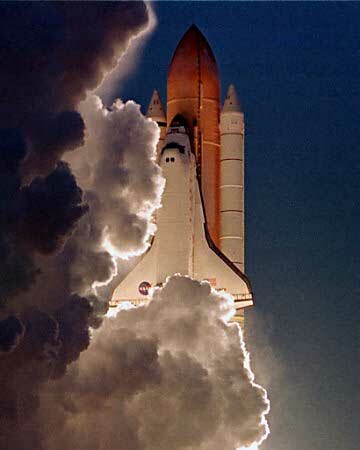 I never did see the shuttle vehicle itself - it was lost in the glow of its exhaust. We waited a few minutes as it ascended into the sunlight - the setting sun hit the upper part of the smoke trail, turning it orange and then higher up, bright white! After a minute or so, we were able to clearly see the solid rocket boosters as they were ejected and dropped towards the ocean. Hint: If you go, get a current Orlando Terminal Area Chart and carefully find the boundaries of all the restricted areas around the launch site. With the exception of the restricted areas and the class D airspace of TIX airport, everything else is just plain old class E airspace. Keep an eye out for other planes - there were several other people who had the same idea! Here are the pictures I took. It was the first outing for my digital camera but it worked fine. The launch site before the launch. 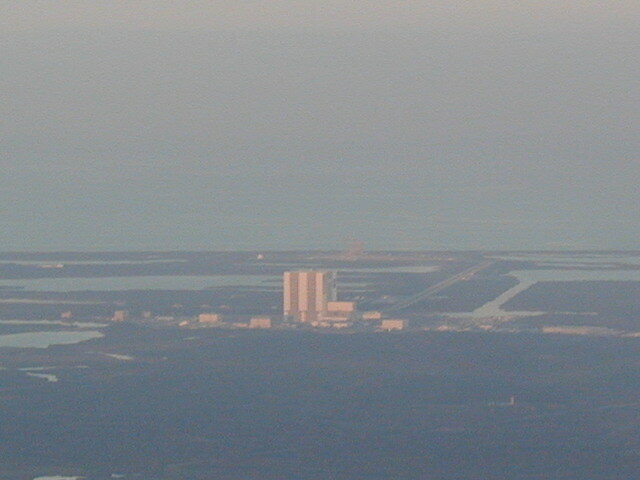 The assembly building is on the left and you can make out the giant road that leads to the launch pad, which is to the rear. All you could see was the fireball as it streaked into the sky. The sun had already set on the ground. 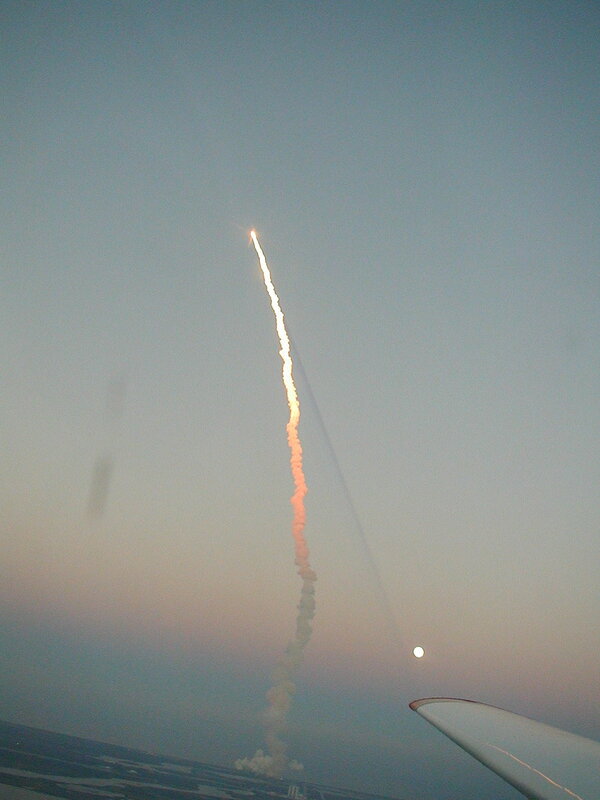 As it got higher up, the shuttle experienced a reverse sunset! 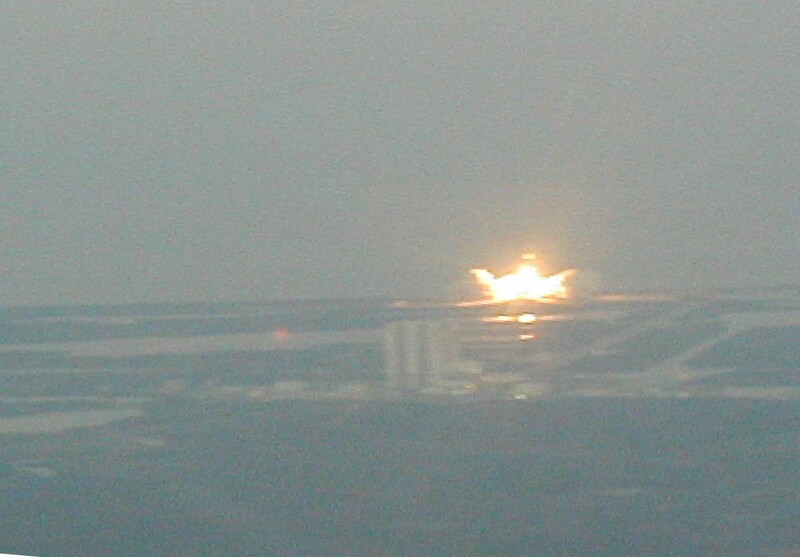 You can see the sunlight color change from orange to full daylight as the plume climbed higher. In case you are wondering, that's the wing float on the Lake, which is a seaplane. The mirror on the wing float allows the pilot to determine whether the nose gear is up or down. In the picture on the right, you can see that the smoke trail is casting a shadow in the air. The moon rose in the east as we were waiting for the launch. 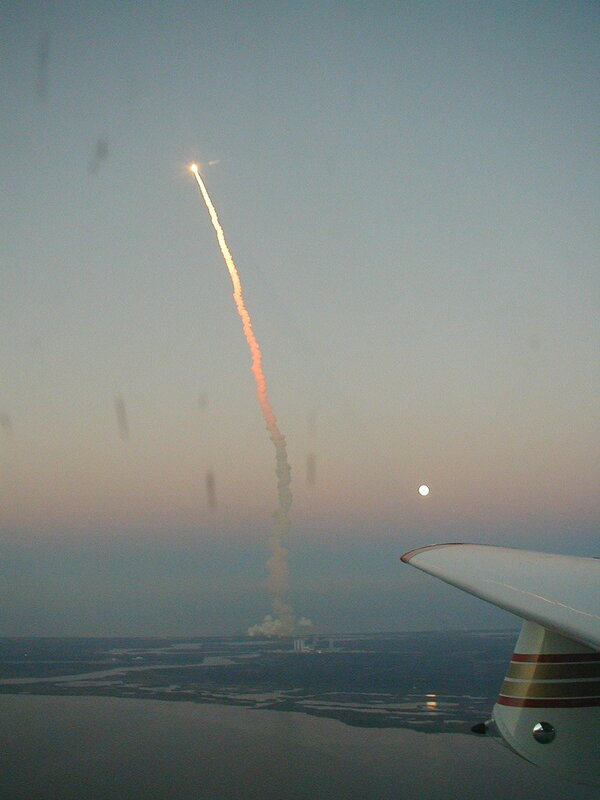 Here, the shuttle has dropped its solid rocket boosters and we headed back to Winter Haven. 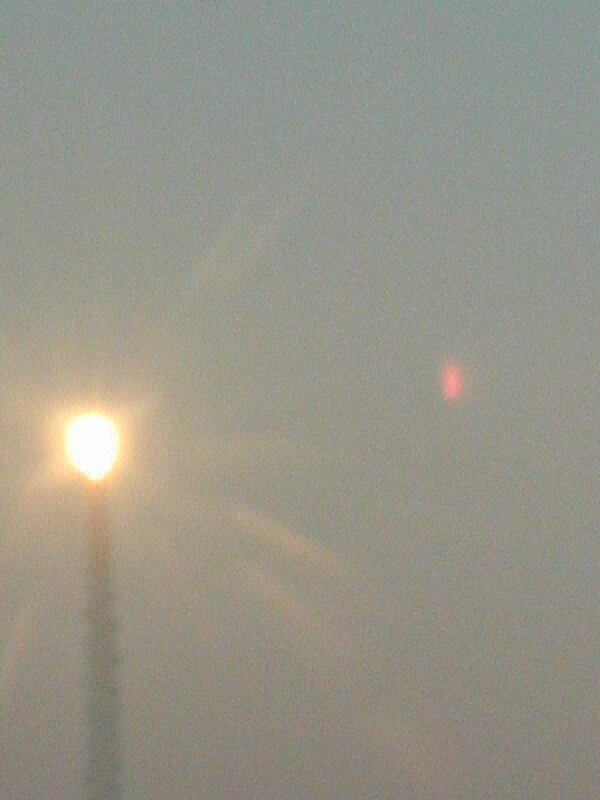 The smoke dissipated in the setting sun as the moon rose. Wow! 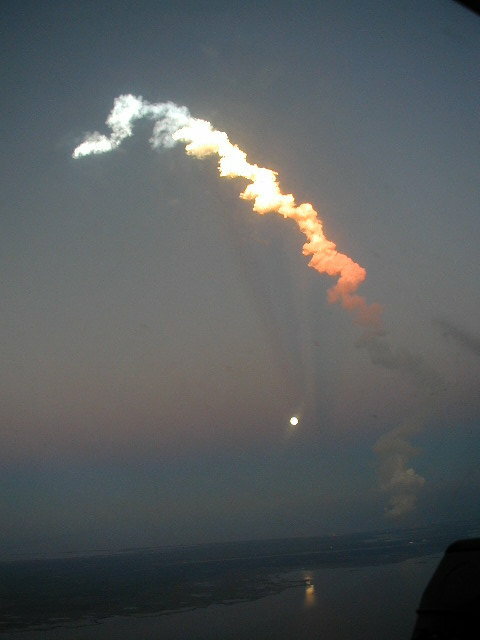 (2/8/01) Many people on hand for yesterday's launch of Space Shuttle Mission STS-98 agreed that it was one of the prettiest ever, with an unusual combination of a full moon and the early evening's sun lighting up the spacecraft's exhaust plume as in the photo at left. For a larger view, click here. As Atlantis lifted off yesterday, the Expedition One crew aboard the International Space Station was marking its 100th day in orbit. Atlantis is slated to dock with the station Friday at 11:58 a.m. EST.